"These fruity, bite-size gems are a sweet treat any time of day." 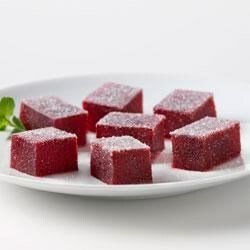 Sprinkle unflavored gelatine over water in small bowl; let stand 1 min. Mix 1/4 cup sugar and cornstarch in medium saucepan. Gradually whisk in juice and unflavored gelatine until blended. Bring to boil on medium heat; cook 5 min., stirring constantly. Remove from heat. Add dry gelatin mixes; stir 2 min. until completely dissolved. Pour into 9x5-inch loaf pan sprayed with cooking spray. Refrigerate 1 hour or until firm. Unmold. Cut into 24 pieces. Coat with remaining sugar just before serving. Yummy! My kids loved them.